In the height of investigation against corrupt POEA officials who are allegedly involved in illegal activities which prompted DOLE to suspend the issuance of Overseas Employment Certificates (OEC) for new applicants and direct hires, two POEA officials has been removed from their posts after being involved in illegal processing of OEC and illegal recruitment. According to Department of Labor and Employment (DOLE), aside from revamp, they already fired two officials who's names were not disclosed. DOLE Usec. Dominador say said that depending on the extent of their liability, the officials will face either administrative or criminal charges which will surely go down to removal from service. 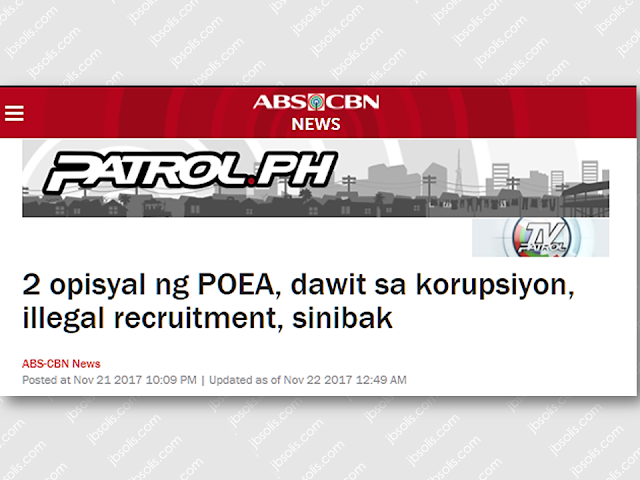 The purge doesn't go only with high ranking officials of the POEA. 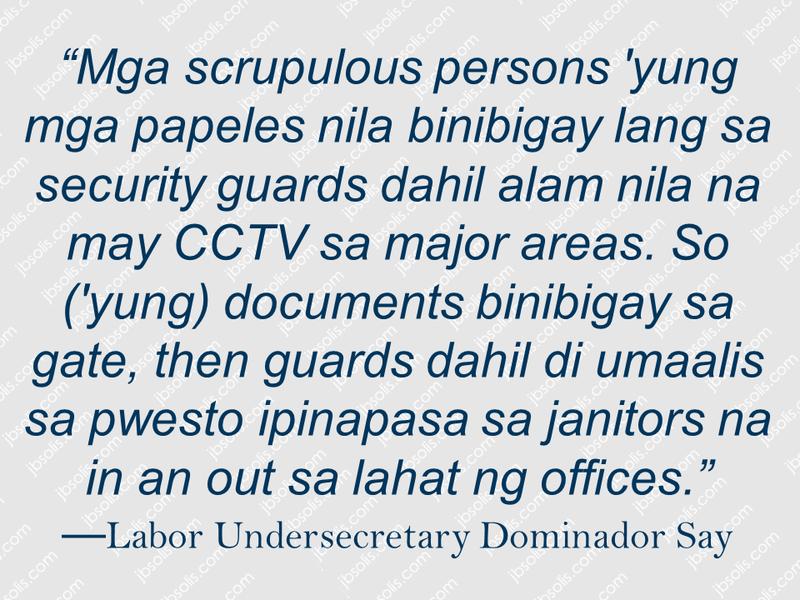 All security guards and janitors will be replaced for their alleged involvement in illegal recruitment. 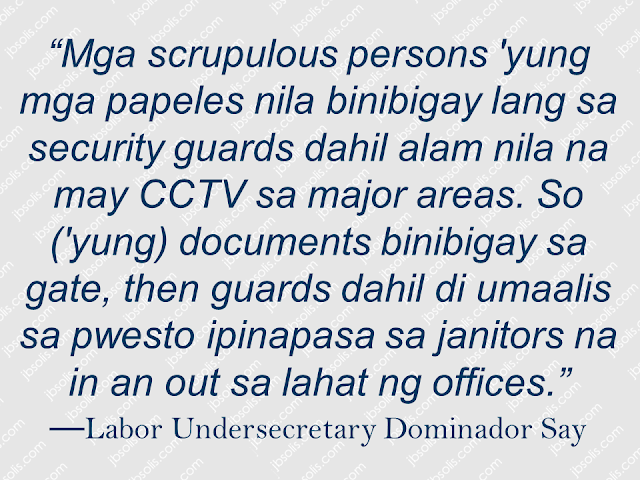 The Department of Labor and Employment (DOLE) on Tuesday said around 40 security guards and 40 janitors of the POEA act as bagmen and messengers in illegal recruitment schemes. 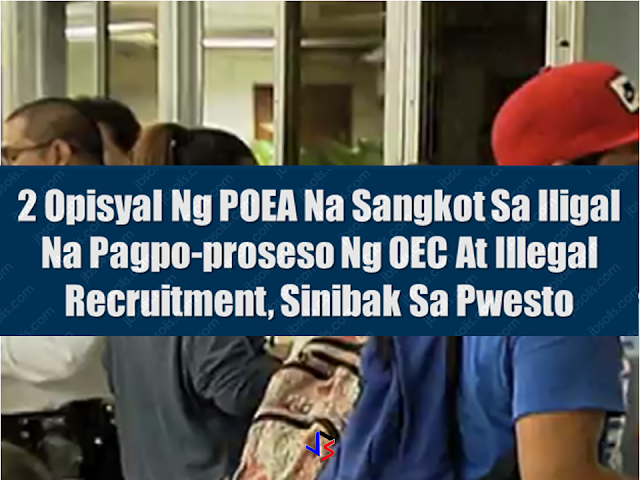 Meanwhile, the suspension of issuance of OEC's is still in effect due to reports that some POEA officials are conspiring with illegal recruiters and collect large sum of money amounting up to P250,000 from their fraudulent undertakings. In spite of the existing suspension, the long queues of applicants in recruitment agencies are still on. DOLE said that they will lift the suspension once they are through with the investigation. The DOLE order also states that the suspension could also be extended depending on the progress of the investigation. DOLE expects that the investigation to be completed on December 1. The suspension of issuance of OEC will be lifted as soon as it is done. Initial estimate of the POEA shows that there are about 5,000 new OEC applications everyday and it is expected that the number of OFWs who will be affected by the suspension will be around 75,000 during the 15-day suspension.